The following rules and requirements (the “Official Rules”) govern the Magic Bullet Inspired Contest (“Contest”). Please read these Official Rules before entering the Contest. By submitting an entry, you acknowledge that you have read, understand and agree to be bound by these Official Rules and the decisions of Capital Brands, LLC (“Sponsor”) the contest Sponsor. NO PURCHASE NECESSARY. VOID WHERE PROHIBITED BY LAW. A PURCHASE WILL NOT IMPROVE YOUR CHANCES OF WINNING. INTERNET ACCESS, A VALID EMAIL AND FACEBOOK, TWITTER, OR INSTAGRAM ACCOUNT ARE NECESSARY TO ENTER THIS CONTEST. The contest begins on March 8th 2016 at 12:00:00 am PST and will be open for submissions until March 15th 2016 at 11:59:59 pm PST (the “Entry Period”). Five entrants will be selected in March, 2016. The computer clock of Facebook, Twitter, and Instagram is the official time-keeping device in the Contest. (c) You must have a valid Facebook, Twitter, or Instagram account to be eligible. Facebook: You may obtain a Facebook account prior to entering the contest by going to www.Facebook.com and signing up at no cost to you. You may not use anyone else’s Facebook account and can only enter through your own Facebook account. Twitter: You may obtain a Twitter account prior to entering the contest by going to www.Twitter.com and signing up at no cost to you. You may not use anyone else’s Twitter account and can only enter through your own Twitter account. Instagram: You may obtain an Instagram account prior to entering the contest by going to www.Instagram.com and signing up at no cost to you. You may not use anyone else’s Instagram account and can only enter through your own Instagram account. Employees and directors of Sponsor or any of their parents, subsidiaries, agents, representatives or affiliated companies, and immediate family members and persons who live in the same household as such employees or persons, are not eligible to participate. “Immediate family members” shall mean parents, stepparents, legal guardians, children, stepchildren, siblings, stepsiblings, or spouses. “Household members” shall mean those people who share the same residence at least three months a year. Go to www.Facebook.com, www.Twitter.com, or www.Instagram.com and login to your account. Post a comment, status, photo or Tweet telling us why the Magic Bullet and Maria Menounos inspire you to be healthy. The comment, status, photo, or Tweet must include the hashtags #MagicBullet #EveryGirlCooking. Entry into the Contest is free, all you need to do is submit at least one comment, status, Tweet, or photograph and follow the instructions above. There is no limit to the number of entries you may submit. You may submit an unlimited amount posts during the Entry Period of the Contest. Submitting more than once will not increase your chances of winning. (a) All entries shall become the sole and exclusive property of the Sponsor, when submitted, and will not be acknowledged or returned. By submitting your photo you hereby grant Sponsor a worldwide, in perpetuity, license to use any and all portions of the photo in any way and via any media in association with the Contest and/or the promotion of the Magic Bullet® product without attribution or compensation to you or your successors or assigns, or any other entity. (b) Photo Guidelines: Your photo must be in a file format and size that is accepted by Facebook, Twitter, or Instagram. Entries will not be eligible if they contain illegal, harmful, threatening, abusive, harassing, tortious, defamatory, vulgar, pornographic, offensive, indecent, obscene, libelous, invasive of another’s privacy, hateful, or racially, ethnically or otherwise objectionable as determined by Sponsor in its sole and absolute discretion. All material contained in the photo must be original and owned by you and may not contain ANY copyrights, trademarks, intellectual property, or other proprietary material that does not belong to you. You may, however, use the Magic Bullet® logo and other artwork from the Magic Bullet® product solely for use in this Contest. NOTE: Your photo may be posted online into a “Gallery” and viewed by other people during the Contest. 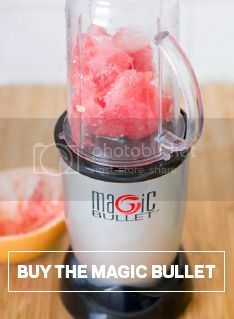 Winners’ photos may be used on the Magic Bullet website. (c) Proof of Submission: Uploading and sending your picture is not proof of receipt by Sponsor. Sponsor shall not be responsible for lost, late, incomplete, invalid, unintelligible, illegible, or misdirected entries. Sponsor shall have the right to reject any photo submitted if it does not comply with the guidelines set forth in these Official Rules. If you have any questions about your submission, please contact Sponsor (see links above). (d) Copyright: All entries must be originals. You must be the sole owner of all materials, images and other creative elements that comprise your entry. Your submission of the photo is your representation and warranty, that you are the sole owner of the photo (and/or have obtained permission from anyone appearing in the photo) and have the right to freely submit the photo. You also represent and warrant that the entries that you submit (i) do not infringe any other person’s or entity’s rights; and (ii) have not been submitted previously in a Contest of any kind. By submitting your photo and thereby entering the Contest you agree to hold Sponsor harmless from all liabilities, including costs and attorneys’ fees, from your breach of this or any other representation and warranty set forth in these Official Rules. (a) At the close of the Entry Period, all submissions by eligible Contestants will be voted upon by the Magic Bullet internal team (“Judges”) chosen by Sponsor. The Judges will select the winner. The winners will be announced by March 22 2016. The criteria used to evaluate the winners will include, but not be limited to, costume originality, creative presentation, quality of the photo and how well personality is reflected in the photograph. (b) For Winners’ Names: As an alternative to seeing the names of the winners on the Magic Bullet page you may also, after March, 2016, send a self-addressed, stamped envelope to: Magic Bullet Inspired Winners, Capital Brands, LLC, 11755 Wilshire Blvd, Suite 1200, Los Angeles CA 90025. (a) Five (5) eligible entrants, selected as winners, will win a Magic Bullet system, our collection of SuperFoods, and a copy of The EveryGirl’s Guide to Cooking by Maria Menounos (approximate retail value $127.73). If you are a winner you will be notified by March 17th, 2016 via Facebook, Twitter, or Instagram from The Magic Bullet account. All winners will have 48 hours to reply and confirm their eligibility before another winner is chosen in their place. Each winner will be required to sign and return, when requested, a Declaration of Compliance and Release. Contest materials, entries and Submissions are subject to validation by the Sponsor. By taking part in this Contest you agree to be bound by these rules and all decisions of the Judges and Sponsor, which are final and binding on all aspects of the Contest. (b) Prize recipients are responsible for any and all federal, state, and local taxes imposed as a result of receiving the Contest prize. By participating in this Contest and/or by accepting any prize that you may be awarded, you agree that Sponsor, their respective parents, subsidiaries, agents, representatives and or affiliated companies, units and divisions; and their advertising and promotional agencies and prize suppliers; each of their respective officers, directors, agents, representatives and employees; and each of these companies’ and individuals’ respective successors, representatives and assigns (collectively, the “Indemnified Parties”) shall not be liable for any and all actions, claims, including any third party claims, injury, loss or damage arising in any manner, directly or indirectly, from or relating to this Contest, including entry and participation in this Contest, or the acceptance, possession, use or misuse of any prize. By participating in the Contest and/or accepting any prize that you may be awarded, you agree to fully indemnify each Indemnified Party from any and all such claims by third parties. Entrants also authorize the Indemnified Parties to use their name, voice, likeness, biographical data, city and state of residence and entry materials in programming or promotional material, worldwide, in perpetuity, or on a winner’s list, if applicable, without compensation unless prohibited by law. Sponsor is not obligated to use any of the above-mentioned information or materials, but may do so and may edit such information or materials, in Sponsors’ sole discretion, without notice or further obligation or compensation. The Indemnified Parties shall not be liable for: (i) late, lost, delayed, stolen, misdirected, incomplete, unreadable, inaccurate, garbled or unintelligible entries, communications or submissions, regardless of the method of transmission; (ii) telephone system, telephone or computer hardware, software or other technical or computer malfunctions, lost connections, disconnections, delays or transmission errors; (iii) data corruption, theft, destruction, unauthorized access to or alteration of entry or other materials; (iv) any injuries, losses or damages of any kind caused by your participation in this Contest or resulting from acceptance, possession or use of a prize; or (v) any printing, typographical, administrative or technological errors in any materials associated with the Contest. The Indemnified Parties disclaim any liability for damage to any phone, computer or other electronic device resulting from participating in, or accessing or downloading information in connection with this Contest. Sponsor reserves the right, in its sole discretion, to cancel, modify or suspend the Contest for any reason and also if a virus, bug, computer or phone problem, unauthorized intervention or other cause beyond Sponsor’s control, corrupt the administration, security or proper play of the Contest. Sponsor may prohibit you from participating in the Contest or winning a prize if, in its sole discretion, it determines you are attempting to undermine the legitimate operation of the Contest by cheating, hacking, deception, or any other unfair playing practices and or if found to be intending to annoy, abuse, threaten or harass any other participants or Sponsor and or its’ representatives. ANY ATTEMPT TO DELIBERATELY DAMAGE THE CONTEST’S WEBSITE OR UNDERMINE THE LEGITIMATE OPERATION OF THE CONTEST MAY BE IN VIOLATION OF CRIMINAL AND CIVIL LAWS AND SHALL RESULT IN, AT A MMINIMUM, DISQUALIFICATION FROM PARTICIPATION IN THE CONTEST. SHOULD SUCH AN ATTEMPT BE MADE, SPONSOR RESERVES THE RIGHT TO SEEK REMEDIES AND DAMAGES (INCLUDING ATTORNEY FEES) TO THE FULLEST EXTENT OF THE LAW, INCLUDING CRIMINAL PROSECUTION. This Contest is in no way sponsored, endorsed, approved, or administered by Facebook, Inc. (“Facebook”), Twitter, Inc. (“Twitter), or Instagram, Inc. (“Instagram”).